Broad College of Business Professor Vallabh Sambamurthy is among the 10 Michigan State University faculty members who will be honored for their outstanding contributions to education and research with the William J. Beal Outstanding Faculty Award (formerly Distinguished Faculty Award) at the annual MSU Awards Convocation Feb. 11. The William J. Beal Outstanding Faculty Award recognizes faculty members for their comprehensive and sustained record of scholarly excellence in research and/or creative activities, instruction, and outreach. Chair of the Department of Accounting and Information Systems and Eli Broad Professor, Sambamurthy is an internationally recognized expert in the field of information systems, particularly digital innovation and competitive strategy. 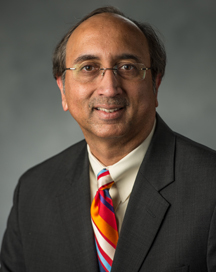 His research, which has influenced corporate practices and been funded by numerous organizations, including the National Science Foundation, explores how firms compete globally by leveraging the capabilities of the Internet and other advanced information technologies in their business processes and organizational designs. As a teacher and mentor, Sambamurthy has not only created and taught several new courses in the MBA masters’ programs, but has guided many doctoral students in their dissertation research and helped them secure academic positions upon their degree completion. The Broad College recognized his educational contributions with the John D. and Dortha J. Withrow Endowed Teacher-Scholar Award in 2010. The recipients of Beal Award, as well as other all-university award winners, will be recognized during the convocation at 3:30 p.m. at Wharton Center’s Pasant Theatre. MSU President Lou Anna K. Simon will congratulate the honorees and take a few minutes to acknowledge MSU’s Founders Day in her 2014 State of the University address. Colleagues, friends, and family are invited to share the event with the awardees.